A long time ago, in a galaxy far far away, Luke Skywalker and the Jedi battled with Darth Vader in a triumph of good over evil. 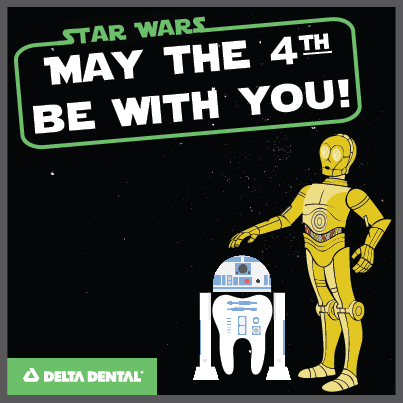 In honor of Star Wars Day, let’s put down our lightsabers and pick up our toothbrushes instead. In tooth brushing, “force” doesn’t always mean your teeth become cleaner. In fact, forceful brushing can cause “toothbrush abrasion,” which can wear down the enamel on your teeth and damage your gums. Place toothbrush bristles at a 45-degree angle to your gum line when brushing for the best coverage. Use a soft toothbrush to prevent damage to your dentin, the tooth layer found just under the enamel. Changing from a hard to soft toothbrush is a great first step to avoid tooth abrasion. Use short strokes and a circular motion rather than sawing your toothbrush across your teeth. As the wise Yoda once said, “You must unlearn what you have learned.” So go forth and be gentler with your tooth brushing. May the force be with you! ← You Have Oral Cancer. Now What?